Becoming pretty popular are image editors or photo manipulators which aren't quite as advanced as Photoshop, but allow you to perform easy modifications to photos. That's where software like Funny Photo Maker come in. This program can perform many different modifications to images which are more fun in nature. You can add cartoons to photos or place yourself in the company of your favorite celebrities. Version 2.4.2 is a freeware program which does not have restrictions and it's free so it doesn't cost anything. 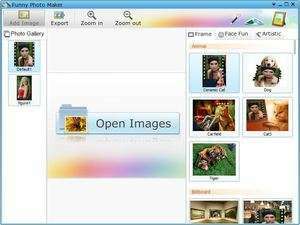 For security reasons, you should also check out the Funny Photo Maker download at LO4D.com which includes virus and malware tests. Additional screenshots of this application download may be available, too. Funny Photo Maker has a presence on social networks.